It is very easy to fall into bad habits when using a computer for hours on end. You care about what you are doing, so can sometimes push yourself too far, or over-strain yourself. The human body isn't built to sit in one position for endless hours, gripping a mouse or typing on the keyboard. Dejal Time Out is here to help. It will gently remind you to take a break on a regular basis. Time Out comes with two kinds of breaks: a Normal break, typically for 10 minutes every hour, so you can move about and relax, plus a Micro break: a very brief pause of typically 15 seconds every 15 minutes, so you can remember not to tense up too much for long periods. You can change, disable or remove either kind of break if desired, and add new kinds of breaks, e.g. fixed lunch or afternoon breaks. 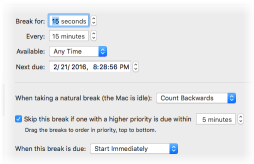 You can configure how long each kind of break lasts, and how long between breaks, and the breaks can be set to count backwards when you take a natural break, e.g. when you go away from your computer. While in a break, a progress bar shows how long till it is over, and optional buttons are available to postpone or skip the break if you can't be interrupted right then. 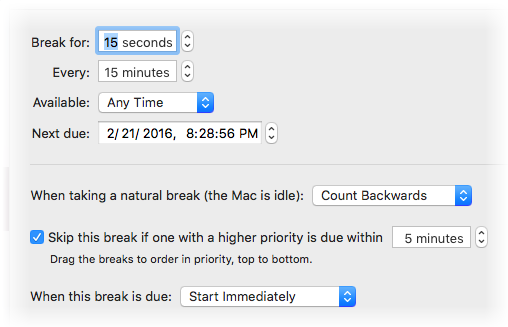 If you wish, you can have Time Out perform various actions before, during or after a break. 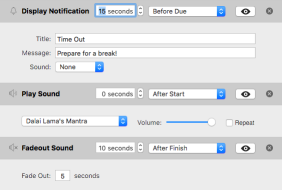 For example, display a notification, speak some text, play a sound, and even run an Automator workflow or AppleScript. 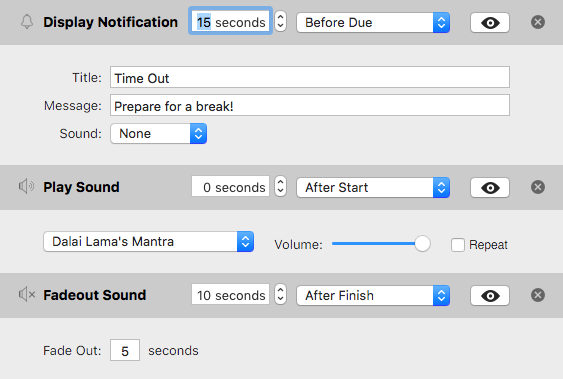 So you can have it notify you shortly before the break is due, then pause iTunes and play a short soothing piece of music or repeating sound at the start of a break, then fade it out and resume iTunes when the break is over. Some useful scripts are provided built-in, plus updates and user-submitted ones available on the Time Out Extras page. Download and try Time Out for free! You're welcome to continue using it at no cost, if you wish. But if you find it helpful, you can become a supporter to assist with future development, and get permanent access to the advanced features. A supporter purchase is not a subscription, and does not automatically renew. Read the Time Out release notes to see what has changed in this version, or read the Time Out Help to find out more about it. Time Out is also available via the Mac App Store. This edition is essentially the same as the one available here, so you can choose which one you prefer.